Sun 20 May: the third 5.30 a.m. get up, another good breakfast on the rooftop and then our last day of temple visiting. Today we went 37 kms north to Banteay Srei, which is listed as a 'jewel in the crown of Angkor temples'. We got there around 8.00 a.m (yes, it takes a while by tuk tuk!) and we're disappointed to see a tour bus already in the car park, however that was nothing compared to the dozen or so tour buses when we left! But this one was a bit of a disappointment, or was it that we were just templed out by Day Three? It's supposed to be a pinkish colour but was more orangey and you couldn't get close to the reliefs as unlike most other temples here they were cordoned off. But to compensate there were some viewing platforms outside the temple overlooking the paddy fields and it was a nice stroll back to the car park this way. 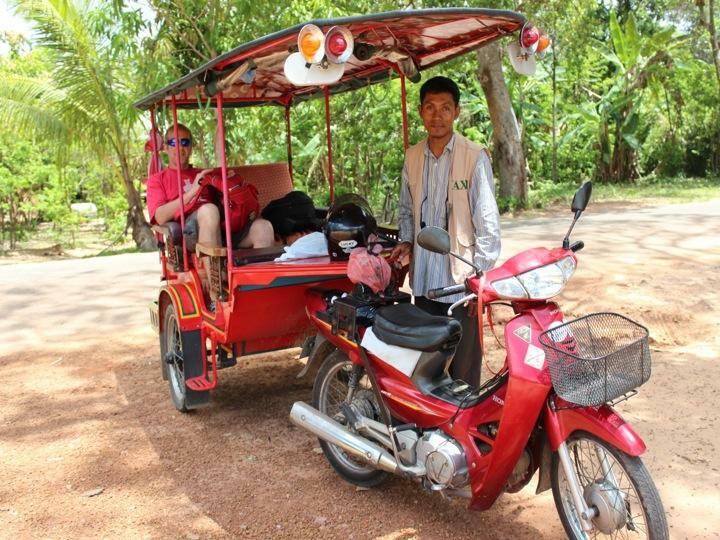 Next we went to Banteay Samre, then on to the Roluos group 12 kms east of Siem Reap; Preah Ko, Bakong and Lolei. I think our enthusiasm had gone as I didn't even take any photos at the last one, though we did stop and chat to a teacher there who trained ad a monk and now teaches orphans in the school attached to the monastery behind the temple. The best thing about today was that we covered a much greater area, a lot of it rural, so great opportunities to see the houses and local ways of life. I mussed a brilliant photo op and wish I'd asked the driver to stop - several boys fishing from a tree trunk hanging over the water. The children at the temple seem to love having their photo taken, some want money for it but not all. Mostly they're there selling trinkets and post cards. Their English is very good, certainly at retail level! Some are fluent in a few languages when it comes to making money off the tourists! It's only ever rained here for a few minutes a day whereas in Phnom Penh it never seemed to stop! Today it was just a few specs, barely noticeable. And still it's around 33 degrees day and night! We booked bus tickets to Sihanoukville for Tuesdsy and will stay here at the Thunborey another night as it really is excellent. Later this afternoon we walked round more of Siem Reap, found a barbers for Mac to get a haircut for $3, found yet more markets and bartered for a couple of things, by which time it was beer o'clock so we found a Russian (?) place to get a Cambodia beer (not tried that one before). Then we went to eat and ended up at the same place in the Alley as a couple of nights ago - mixed Khmer salad with pork, duck curry, prawn amok, jasmine rice and two beers for under $11 and again excellent. Food heaven! More tomorrow.